Receiving awards and certificates is a very special moment for every one which they will treasure and cherish it forever. Certificate of appreciation is the most common way to acknowledge people’s hard work and achievement. It is not only an honor for the people who get it, but it also brings pride for the institution to issue the certificate for them. But how do we make the certificate sound meaningful without making it dull? Before writing the certificate, one should be aware of what to write and what not to write in the certificate of appreciation wording. A certificate is an official document attesting or recording a particular fact or event, or achievement, or fulfillment of legal requirement. A certificate of appreciation is a certificate given to those who have achieved something, to reward to those who have done good in their academic or work, and those who have done something for someone that is appreciated. There are many different types of awards given on the basis of various occasions and achievements like: Thank you awards, years of service awards, performance awards, honor awards, retirement awards, customer service awards, sales awards, etc. Each one is different from another as their nature of achievement is different. Hence, the certificate of appreciation wording for each one of these should be different too. While there are so many templates and formats available for each type of certificate, you can customize or personalize it according to the awarded or their nature of achievement. A theme and a logo of the organization is a must for every certificate. 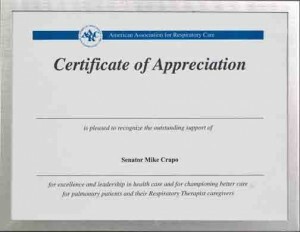 If quite a number of certificates are needed, you should design a template and after that, you can enter the certificate of appreciation wording easily. After choosing an appropriate theme for the certificate, begin with the complete name of the organization issuing the certificate and its logo. It should be bigger than the rest of the wordings in the certificate and should be highlighted. Start with the certificate of appreciationwording. It’s best to use formal language and all kinds of abbreviations should be avoided. State the name of the organization who is issuing this certificate and to whom it is awarded and on which occasion, based on which achievement.For example: This is to certify that Mr/Ms/Mrs….. of class/department/batch…… is awarded this certificate for/in recognition of….. Include a special compliments or shortly describe the accomplishment, achievement, if required. Finally, the signature and stamp of the authorizing person is needed with the date of signing. Name and the title of the person who will sign the certificate should be there as well. Leave some space for the signature area at the bottom of the certificate. And done! There you have it, just four simple steps you need to know about a certificate of appreciation wording. 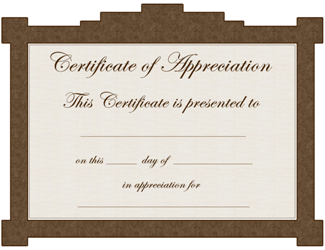 Remember, the certificate of appreciation wording needs to be short but precise, meaningful but formal.